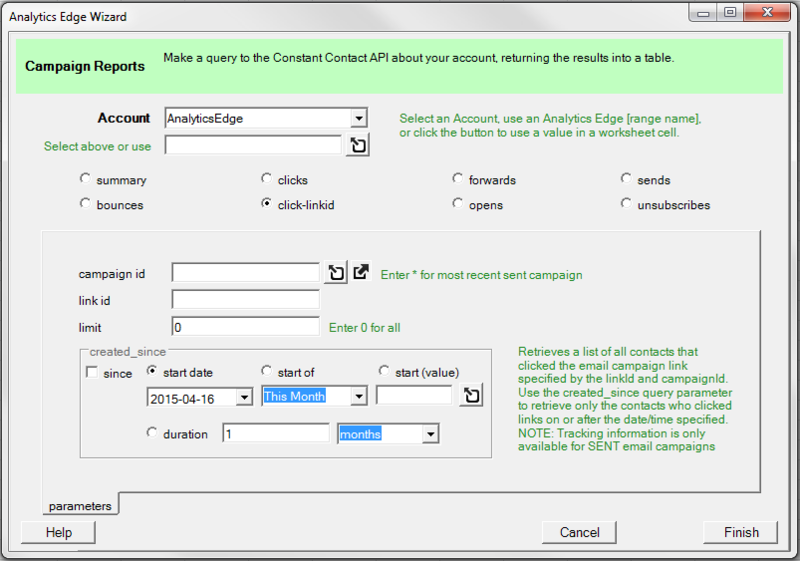 Use this wizard to get details about specific link clicks for the selected Constant Contact campaign. The campaign is identified by the campaign ID number. You can use the campaign selector popup to pick a campaign from those available, enter an asterisk (*) to automatically get the most recently sent campaign, or reference a value in a worksheet cell. 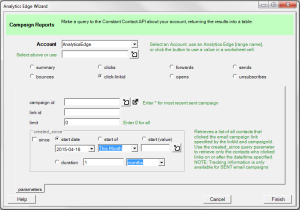 Campaign ID – enter a campaign id number, enter * to get the most recently sent campaign, or enter an Excel worksheet cell reference (use the button provided) . You can also use the popup campaign selection wizard to pick the campaign of interest . Select the campaign in the popup and click OK to get the campaign id. Link ID – enter the link id for the link of interest. You can get the link id from the Campaign Reports – Clicks report. Limit – using a limit of 0 will download all click details for the campaign link. You can limit the number by entering a value. Created Since – If you are only interested in more recent items, you can use this option to pick a start date or time period (relative to today).